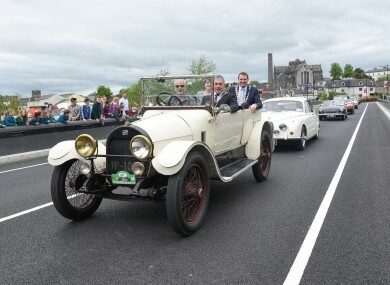 Kilkenny County Council Cathaoirleach, Matt Doran, with Council CEO, Colette Byrne, and Mayor, Patrick O'Neill, in the back seat. A CONTROVERSIAL NEW bridge has opened in Kilkenny. The St Francis Bridge raised the ire of demonstrators who campaigned throughout 2015 to block the scheme. However, the case was settled out of court in April 2015 and the 118 metre bridge was officially opened today. The five span bridge is part of the long-awaited €16.7 million Central Access Scheme which city officials say will help create a “compact, vibrant, lived-in city”. The need for a new road and river crossing was first identified back in 1978 in a Kilkenny Traffic and Land Use Review. It will allow the city to develop and grow in a planned way and will enable the immense potential of adjoining sites, Kilkenny County Council CEO, Colette Byrne, said. “The new Saint Francis Bridge, and the Central Access Scheme as a whole, will encourage and facilitate the redevelopment of the very heart of our city, consolidating the city and reducing the pressure to develop at the edge of the urban area. “We are very cognisant of the key role played by our elected members, past and present, and are thankful to the residents of the area and the general travelling public for the patience they afforded us and our agents during its construction. However, local councillor Malcolm Noonan wants the bridge closed already. He told the Kilkenny People that he had received reports of near misses between cyclists and motorists. “There seems to be a lot of confusion coupled with excessive road engineering causing major problems in the first days of operation. It is inconceivable that the local authority can allow the ‘wait and see’ approach to prevail in light of such incidents. Email “Controversial Kilkenny bridge finally opens”. Feedback on “Controversial Kilkenny bridge finally opens”.